Presented by 13P, at the East 14th St Theatre. Well I certainly don't agree with Mr. Isherwood that this new 13P play by Ann Marie Healy is a juvenile waste of time. While I would agree the last 20 minutes or so make no sense at all--and is thus kind of a let-down--I can't deny I was engaged, and, yes, often surprised, by this at least unpredictable and breezy 70 minute-work. No cookie-cutter script this, Have You Seen Steve Steven starts out in what is in one way familiar territory--a middle class suburban living room, focusing on a teenager's strained relations with her parents. 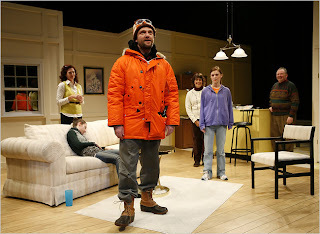 On the other hand, the tacky McMansion trappings of the setting and the protruding Minnesota accents do provide some refreshing specifics to what in so many other plays is generic. Also, right from the outset, the relationship established between the young protagonist, Kathleen (Stephanie Wright Thompson) and the audience takes us intimately into her state of mind skillfully, without recourse to monologue or asides. The discomfort of Kathleen and two other kids brought over by family friends for an achingly banal dinner party is made silently palpable by Anne Kauffman's subtle direction. The non-English speaking foreign exchange student is an old trope by now, but as played by ghoulish and stick-figured Jocelyn Kuritsky, this character's foreignness becomes as frightening as it is hilarious. And I say frightening because Healy's gamble here is to ever so gradually morph a quirky family comedy into a modern-day Brothers Grimm fairy tale. The little steps by which that happens are truly chilling. Many of them involve the mythically named Hank Mountain (Matthew Maher) a mysterious "neighbor" who shows up at the front door unannounced, sure enough bedecked in full Paul Bunyon gear--except for the sun goggles oddly perched on his disturbingly too-cute poofball hat. Maher's high-pitched unwavering voice and reassuring donchya-know accent--the lingua franca of the play's adults--make almost everything he does unbearably creepy. (Maher also manages to communicate flickers of true menace by simply dropping the frozen smile from his face at chosen moments.) And when Hank's cohort, a little old lady with a tray of brownies, enters, we know we're not in Minnesota anymore, but the old gingerbread house of lore. Which brings us to that ending... While its deliberate obscurity gets infuriating at times (I guess I can see what made Isherwood so clearly angry!) I can't deny I remained on the edge of my seat in curiosity. As Healy morphs out of Brothers Grimm into David Lynch territory, you might even get excited at the prospect of such a hybrid. In the end I just think she doesn't pull it off. The aesthetic stakes are raised so high by that point that it's a situation where a playwright has to deliver. Steve Steven, however, just kinda fades out on this note of weirdness. But it's not easy to forget. And in yet another intensely crafted and strongly acted production by Kaufmann (who last year brilliantly helmed two other haunting new plays, The Thugs and God's Ear) the play's best elements are allowed to shine. Despite--or perhaps because of its flaws it ends up making a very strong case for the merits of the whole 13P enterprise. This is a script that you can just tell would never make it out of development hell. In readings it would amuse but then just befuddle. Only in the hands of an expert director and a fully professional cast can all its unspoken assets impress. And only after seeing it done to the hilt this way can audiences--and perhaps the author--see what might best be revised. Here's hoping Healy is encouraged by this fine production to either take this script further, or just get on with the next one. Well put. I agree that the ending is all too ambiguous, but to that end, a lack of clarity is sometimes a good thing too: it may not deliver on its promise, but it delivered many of the audience members into fits of quizzical discussion. I don't often see people TALKING about a lot of what's out there (probably because so much of it is easy entertainment). My hope in writing a theater blog is that people will blog their thoughts and encourage others to jump in, or to link from review to review, encouraging arts-minded debate (and perhaps sparking more interest in these development-hell plays). Glad that you've kept your comments on! I thought Isherwood's diatribe about why he can't comprehend women playwrights (cunningly disguised as a review) was disgraceful in its condescension. (Note that all the luminaries he mentioned are men, all are white, half are dead.) His final comment on the superiority of Twister teleology over a dramatic gesture was just smarmy. I'm really looking forward to seeing Steve Steven! I've read a couple of drafts, and it's always shocked, disturbed, amazed, and engaged me, even just on the page. It's interesting the ire Isherwood still stirs up on theatre blogs. But I really don't think that reflects any predisposition of bloggers and blog readers toward more foaming at the mouth than other theatre folk. It's just that blogs are where people--theatre artists, particularly--congregate now to talk about Off and Off-Off B'way. And that is Mr I. 's beat. The New York Times critic is indeed the "hot seat" (as Frank Rich dubbed his retrospective), and even though Ish is "2nd string", that seat by default is poised to be the Butcher of non-Broadway. So it's only natural he would be hated/feared by those who depend on his reviews for career success. (If that's true of the Times for a downtown career still.) I think what particularly irks artists about his negative reviews is they make no bones about not liking the taste or aesthetic of a piece, not just structural or execution flaws. Which does lead me to wonder occasionally whether Charles Isherwood is just a very smart, good critic on the wrong beat. His inclination may just not be for formally experimental work. So if I ever were to protest the Times about him, it would never be to fire him, but to reassign. Let him be just the Off Broadway critic, and leave Off-Off to perhaps a team of intrepid younger critics who are more well versed and predisposed to a wider palette of styles.